We are proud to have Yelp back as a sponsor this year at Detroit Urban Craft Fair, and can’t wait to attend their own holiday event coming up this Thursday, November 9th at Leon & Lulu in Clawson! 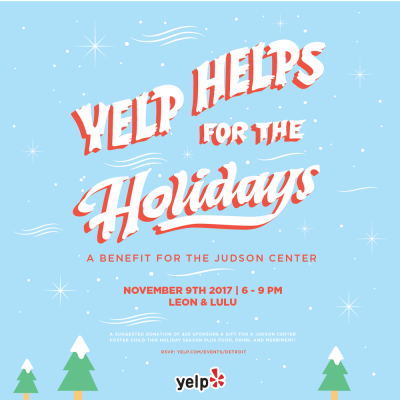 The 4th Annual Yelp Helps for the Holidays is benefitting the Judson Center, who will be providing holiday gifts for each of the children in their foster program. 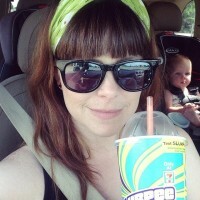 Last year Yelp raised over $7000 to provide gifts to 250 children, and this year they are hoping to raise even more! For just a $20 donation, you will help sponsor their gifts to the Judson Center, and you can also enjoy free snacks & drinks, and music by our own DUCF DJ – DJ Dave Lawson – while you shop. Leon & Lulu will be donating 10% of all proceeds from sales that night to the Judson Center as well. And of course, arts & crafts! Get a custom caricature from artist Nicole LaPointe, and get creative withJulizbeth Photography, who will be hosting an Ornament Make & Take! RSVP for the 4th Annual Yelp Helps for the Holidays here. All ages are welcome.